“Since I no longer want to be a false witness or a caretaker minister with the duty to sign the ministry’s mail, which something an acting minister can do and since I don’t want to violate the constitution despite any political stance, I decided to free myself from my duties ,” he said during a press conference at his ministry. 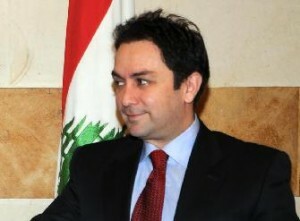 Baroud added that he witnessed, along with the Lebanese people, the breakdown of the Lebanese state. “I say to the Lebanese that taking them hostage is no longer acceptable,” Baroud said. “I have come to realize in the past few days that the problem in Lebanon is much greater than it appears to be,” he stated. The interior minister also said that he tried for three years to serve the country, but added that there is no longer a reason to do so and that the constitution is being trespassed. Baroud’s decision came after security forces prevented Resigned Telecommunications Minister Charbel Nahhas, several directors at the ministry, and a technical team from entering one of the ministry’s buildings at the Adlieh area to dismantle a mobile phone station belonging to OGERO Telecom.. The minister asserted that he has long refused to take sides in the ongoing political divide in Lebanon, adding that the political camp that caretaker resigned Minister Nahhas is affiliated with has not spared him its criticism, while he has no dispute with the other political camp. These are signs of civil strife and may be civil war which serves Syria… God help the Lebanese people who have nothing to do with the thugs who hijacked Lebanon. Syrians still think Lebanon is their backyard. True!It s hard ti ¨serve the country¨when some politicians ,ministers,officials,and so on continue to attack,accuse and threaten,when they serve their egoistic political interests and those of their allies,disregarding the interest of their country and their people! !A state is not built by such people!A state is built by great statesmen with visions and policies that serve their country and their people! !Courageous men are needed to face the dangers and speak the truth! De3ano…this guy is an actual politician who CARES about Lebanon . That’s another potential leader lost… back to the old men. I used to like Baroud for his professionalism, humbleness and care for the public interest, but lately I noticed that he has been siding a lot with the March 8 positions and covering for them. Like the Telecommunication minister Nahas, who gets his orders from HA (and/or their Syrian bosses) and wants to bypass the laws and cover up for criminals. Apparently Nahas is forbidding the security people from having access to some tele-communication in the case of the kidnapping of the innocent Estonians.